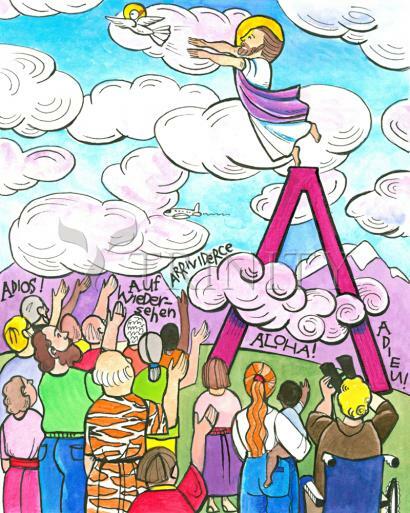 The Ascension of Jesus is the departure of Christ from Earth into the presence of God. Jesus, in the company of the disciples, is taken up in their sight after warning them to remain in Jerusalem until the coming of the Holy Spirit; as he ascends a cloud hides him from their view, and two men in white appear to tell them that he will return "in the same way you have seen him go into heaven." Forty days after his Resurrection, Jesus ascended into heaven. During this period between his Resurrection and Ascension, He actually gave the primacy He had promised to Peter, as read in John 21. The many events between His resurrection and ascension preclude the theory that He ascended on Easter. His ascension does not mean that heaven is somewhere up in space. This was a way of making clear that He was leaving the present mode of existence. St. Paul in Colossians 3:1 urges us to live our lives now as if we had already died, had risen, and had ascended with Him. In a mystical sense we have done that, in that our Head has done that. In the physical sense it is still in the future. He ascended to receive the glory due to Him as conqueror of sin and death (Philippians 2:8-11); to be our Mediator and advocate with the Father (Hebrews 9:24); to send the Holy Spirit as He had promised at the Last Supper (John 16:7); and to prepare a place for us as He also promised (John 14:2). Now He is seated at the Father's right hand, which means that, as He said, "all power has been given to Me in heaven and on earth (Matthew 28:18). He always had that power as God, but now He exercises it as man, as King of the Universe, with His Mother beside Him as Queen of the Universe. As God, He is everywhere, but not as man, though He is present on earth most widely in the Holy Eucharist, even as man. Besides this real bodily presence in the Eucharist, Christ is present on earth in other, lesser ways. Vatican II explained the various forms of presence, in the Constitution on the Liturgy, # 7: "Christ is always present to His Church, especially in liturgical actions. He is present in the Sacrifice of the Mass in the person of the priest; 'He is the same one, now offering by the ministry of priests, who then offered Himself on the Cross [citing the Council of Trent].' But He is most greatly present under the Eucharistic species. He is present by His power in the Sacraments, so that when anyone baptizes, Christ Himself baptizes. He is present in His word, for He speaks when the Sacred Scriptures are read in the Church. He is present, finally, when the Church prays and sings the Psalms, He who promised 'Where two or three are gathered in my name, there I am in their midst'"(Matthew 18:20).